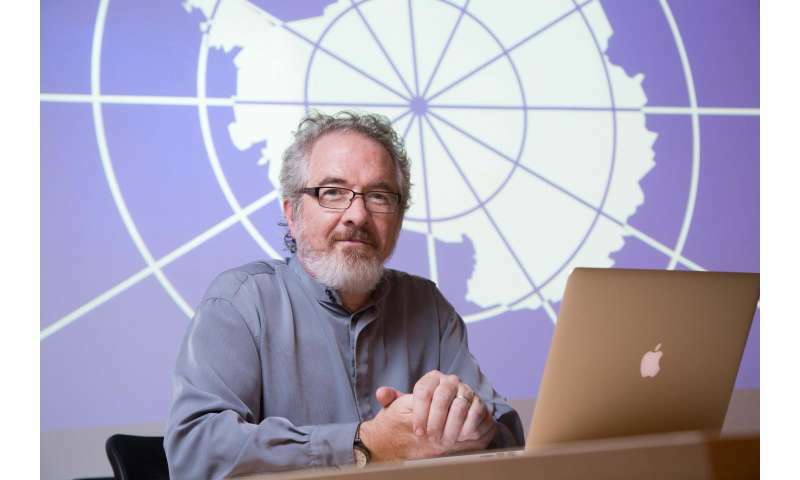 A SUNY Geneseo faculty member is in Antarctica with a team of climate scientists this month where he is gathering information to compose music based upon seismic data gathered at the site. Glenn McClure, who serves on the faculties of both Geneseo and the Eastman School of Music, will be working through mid-November with Peter Bromirski and his associates from the University of California San Diego's Scripps Institution of Oceanography. Bromirski is the principal investigator on the project, which is employing seismic sensors on the Ross Ice Shelf to better understand the Antarctic melting process and the viability of the shelf. McClure will use a mathematical conversion process to bring the infragravity sound wave data into the hearing range, generating material for music that is embodies the messages within the ice. "This is one the most exciting projects I've ever been associated with as a composer," said McClure, who received the National Science Foundation Artists and Writers Fellowship for the project. "I'll be at one of most remote places on Earth to collect scientific data from ice shelf vibrations and later convert the data to sound to present in both choral and instrumental music performances. We will transform raw scientific information from this remote natural environment into musical compositions." McClure will be using sophisticated audio and video equipment to gather data in the frigid climate and will connect to the Geneseo campus remotely to send live verbal and visual reports of the experience, which he calls "an icon for the liberal arts." "One of the things we artists can do is to explain the work of scientists to the general public," said McClure. "It accommodates the ability of scientists to communicate with people outside of their field. This examination of the synergies between the arts and sciences goes to the heart of a liberal arts education." Geneseo students will be following McClure's progress and are now working on directed studies in physics, geology, mathematics and history to create a body of materials that will supplement McClure's musical work. These materials will be made available to middle and high school classrooms in the spring. McClure has had a distinguished musical career, including additional compositional work that has driven other partnerships between scientists and artists. He recently composed a work for choir and string quartet for the European Space Agency, working closely with scientists and mathematicians from the Rosetta Mission to transform orbital data into melodies and harmonies. McClure has achieved his success with the disability of stuttering, which he learned to control at age 11. Prior to that, he says it was music - particularly singing - that allowed him to share his story, thoughts and feelings. "Just as stuttering once silenced me and music gave me a voice, I want to give a voice to the ice of Antarctica through music," he said. "My creative process is rooted in my experience of music and disability." Could sing-a-long science be the key to good grades?